We knew it was coming, but now it’s official: Android P includes official support for camera cutouts – sometimes called notches – as seen in the Essential PH-1 and iPhone X. There are already multiple phones on the way this year expected to arrive with a camera cut out, with many more surely on the way. According to the documentation, developers will be able to automatically change the status bar height to accommodate the notch and avoid irksome letterboxing. Alternatively, if the app or some of its content works better in a full screen view, it can display around the notch as well. Developers will be able to simulate a notch on their notch-less devices to help make sure everything looks tidy when creating their apps. 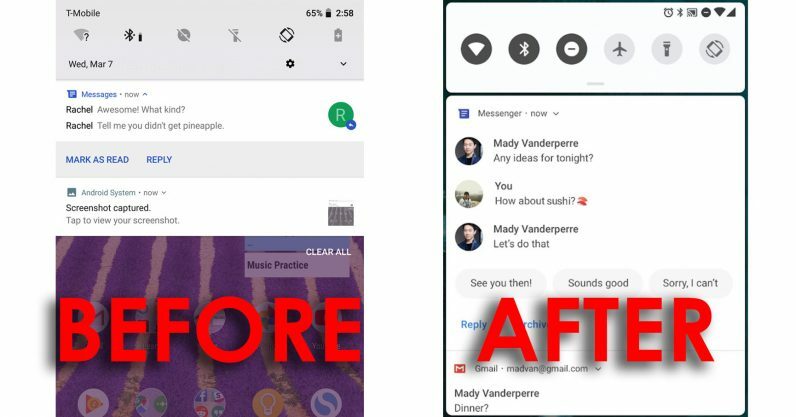 Android Police also points out that the time is now shown on the left side of the screen – perhaps to be more symmetrical around notches – and that the settings menu is now a lot more colorful. That’s quite a shift – Android P looks a lot more bubbly on the whole. It may not be final, but it still gives a taste of the new look Google is going for. Speaking of the notification shade, Google has a few practical improvements in that area too. Android P introduces support for more informative alerts from messaging apps. As seen in the image above, you’ll be able to see messages in the context of a conversation, send AI-powered smart replies, and view attached images right from the notification shade. Notifications are arguably the heart of the Android experience, so Google is constantly looking to evolve that part of the OS. Plenty of Android phones come with multiple cameras, but in most cases, you need to use the pre-installed camera app to take advantage of them. Android P includes native support for multiple cameras. That means you’ll be able to use features like zoom, bokeh and even stereo vision (3D) within the camera sections of other apps like Snapchat or Instagram. Assuming, of course, that those apps add support. Android P introduces support for the IEEE 802.11mc Wi-Fi protocol, also known as WiFi Round Trip Time (RTT). What all those letters mean is that your Android device will help you navigate while within indoor locations – where GPS normally can’t reach or isn’t precise enough. RTT is precise enough to pinpoint your location within 1 to 2 meters. Finally, you’ll be able to make your way through your maze-like local mall. Android P includes native support for HDR VP9 Profile, which will make it easier to watch HDR movies for streaming sources on HDR-compatible devices. Then there’s support for HEIF. If you’re not familiar, it’s the super-efficient image compression format Apple popularized with iOS 11 last year. It can compress images to less than half the size of a JPEG, while maintaining higher image quality. With HEIF becoming increasingly popular, it could go a long way towards saving precious storage on mobile devices. If you want to read more about Android P or install it on your own device, head on over to the Android Developers Blog. Keep in mind this build is only meant for developers; while public previews will arrive later in the year, you need to flash this one to your device manually. All that being said, Google typically saves the best new features for Google I/O. If you’re not a developer, you’d probably be better off waiting before you test drive Android P anyway.